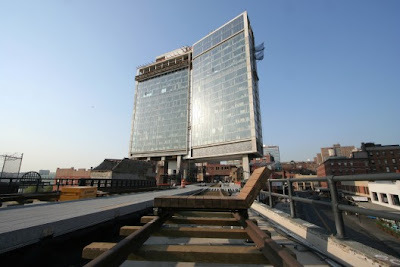 I did some posts on the High Line in NYC back in March (along with it's fine French predecessor) - and have been tracking it for a bit. There's been some movement in construction, which I will get to in a bit, for now - I just love this one too much not to post it right now... enjoy. This idea of rolling furniture fulfills a few functions. 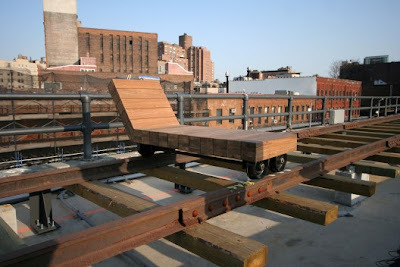 On one hand, it brings up the wonderful adaptation strategy of public space advocated by many, including William Whyte - that movable furnishings allow people to customize the spaces they inhabit. Although constrained to one direction in this case - it's a step in this direction. 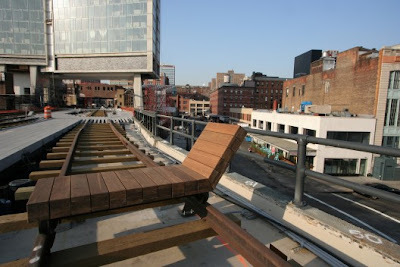 Second, and potentially as powerful, is this simple way of reconnecting in a very inventive way to the historical railyard context in a functional, not just ornamental way. 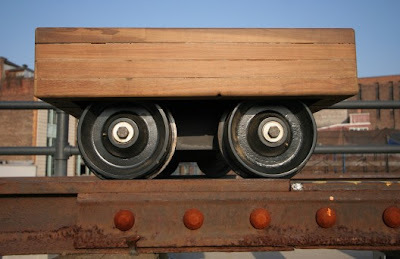 True... a recent post mentioned the project with a pic from Schwartz's Manchester Exchange Square, with rolling 'cart' benches... which look to use actual narrow gauge train wheels.